A good start as I discovered I had finished 17th on the first stage in the combined Moto amateurs (all ages) and 4th in the over 50s category. After a short ride out of town we started on sandy, dusty tracks which were tricky to ride, especially as I have very little experience on sand but soon settled into the technique, weight back and give it gas! More fast flowing and stony tracks followed, at times becoming very rocky until we were stopped by the organisation and redirected onto a stony piste for 14km to bypass a section of track that had been washed away. This was a fairly main road and had a lot of traffic. The dust, especially behind some of the big service trucks who were also using the road was horrendous with visibility down to two or three metres at times. There was some controversy here with some of the competitors driving far too fast on what was a main public road, as the result of one of the trucks overtaking Donna and Colin from Torque Racing in the van at high speed, a rock took out one of their side windows! 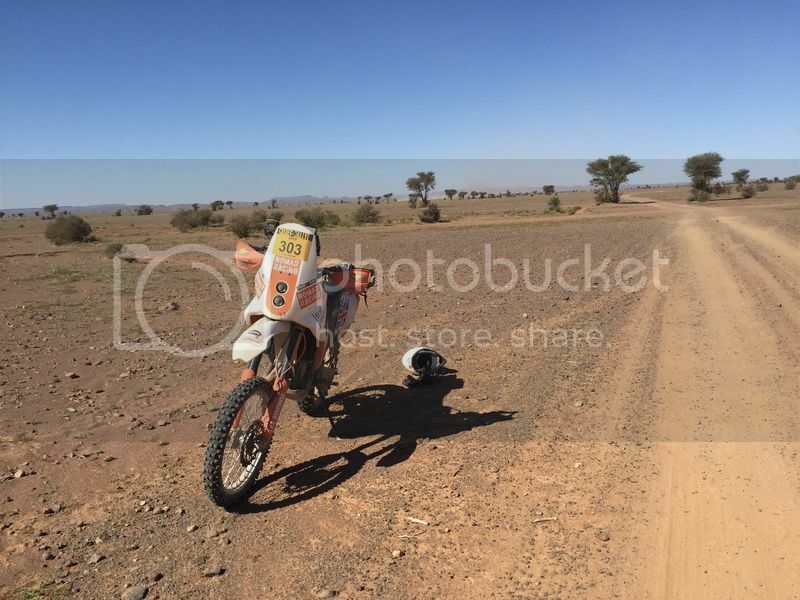 For myself it was not a pleasant experience, the road was being used by a lot of the service trucks heading for CP1 and the dust being kicked up even at legal speeds was horrendous, driving into the dust, visibility was cut to about 5 metres... scary stuff! At one point I was hit hard in the goggles by a stone, luckily it took the impact without any worries but when I got to CP1, I discovered it had come along for the ride, wedged into the side of my goggles. After 14km we switched back to the road book and turned off the piste to shortly arrive at a five way junction. After a bit of riding round in circles as I had approached it from the "wrong" direction (I wasn't the only one) I worked out which of the five tracks to take and more fast flowing tracks followed before we went back onto the same main piste that led us into Checkpoint 1 where I was expecting to meet John and re-fuel. Only John hadn’t made it! 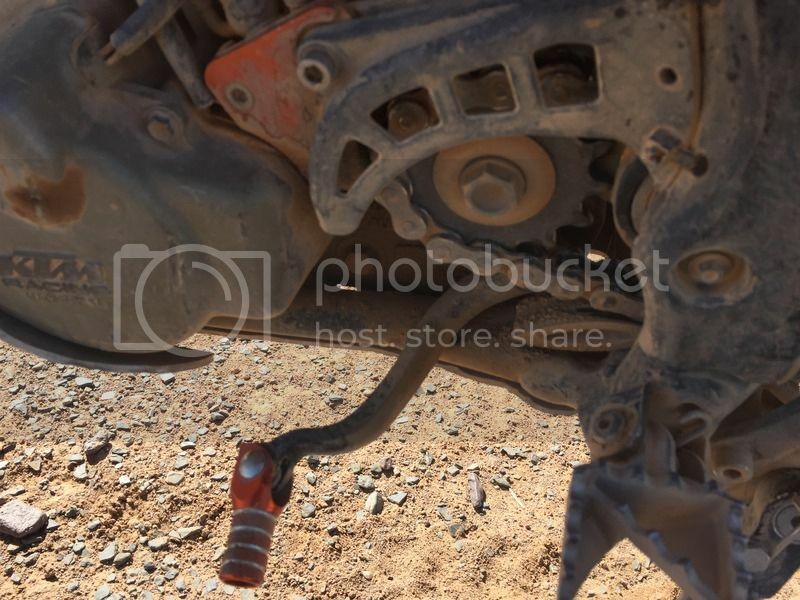 Luckily Donna gave me 5 litres to top up my tank and I also discovered that both my clutch and brake levers were loose as the bolts had vibrated out on the stony tracks. Luckily I hadn’t lost the bolts completely and Colin tightened them up for me. This was despite almost every bolt on the bike (including these ones) having thread lock applied before the rally. This part was a real test of the bike but despite these minor issues was running well. Just as we were finishing John rolled up, the stony road having taken him much longer than anticipated, a fact of life in Morocco we were discovering! Some more fast tracks followed then wide open stony plains where wide full open was the order of the day. However slowing to ride through a belt of trees, I went to change down a gear only to find no gear lever! It too had vibrated loose and again I was lucky that the bolt hadn’t yet fallen out. A quick stop to tighten it up and I was away again. Long open and sandy sections, a small section of dunes and some very soft sandy tracks continued before we came to a sharp right turn to cross the Qued Ramilla. I turned where my trip meter indicated and there were various tracks on the ground but noted that others were carrying on a bit further before turning. I dropped into a small river bed and realised straight away that I had turned a bit too early, so attempted to ride along the side of the small stream back to the correct route…. At which point the bike sunk to its axles in what appeared to be mud! It was in fact quicksand! Now don't think of the stuff of cartoons and movies where people sink into quick sand, never to be seen again. It is simply deep saturated sand that is extremely difficult to extract yourself from. After some considerable time of trying to extricate both the bike and myself, I resigned myself to having to leave the bike, trek back to the correct route and get someone to notify the organisers so I could get assistance. I realised this would be the end of my day and although I would be able to start again the next day, I would receive a whole heap of time penalties. Leaving the river bed, I discovered I was at least 500m off the track but whilst walking towards the sound of engines in the distance, a local suddenly appeared on his moped. 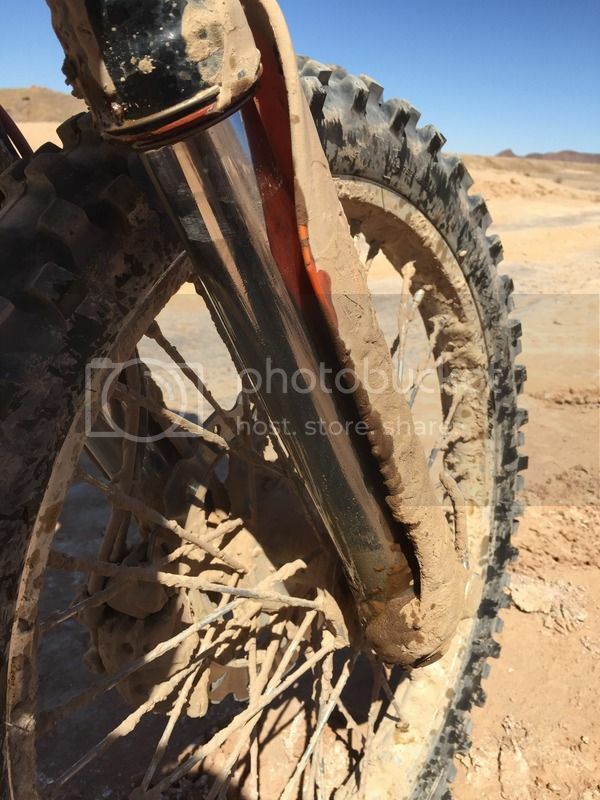 Seeing me caked from head to foot in the sandy “mud” he enquired what had happened, so I took him to see the bike. He had a closer look with me and then ran off back towards his bike. He reappeared with a huge shovel that he must have had strapped to the bike, proceeded to strip to his shorts and dived on in to attempt to rescue the bike. He introduced himself as Sayeed and showed me how to extract myself from the sand as I frequently became stuck. The technique is to just stand and gradually wiggle your feet from side to side until the suction suddenly breaks and you can haul your feet out. We used a similar technique and lots of digging to get the bike on its side, spun it round and managed to get it back to the bank by following the relatively solid route I had originally ridden along. Sayeed then started the bike, and shot off for a ride! I think he was having great fun compared to his little Mobylette but did return. The rescue cost me 200 Dirhams, nothing to me (about £13) but I later learnt would most probably be a Month’s wages to Sayeed. I didn’t care as I would have paid anything to get out of there. The Qued Ramilla turned out to be several kilometres wide and then led into sandy tracks and small dunes that were hard work. After reaching a secret checkpoint, I discovered I was still well within time and continued as the trails got rocky again before making it to the final checkpoint of the special. Soon after this I could smell burning oil so fearful that my engine was leaking again, I pulled up to find the right hand fork seal had blown. Nothing I could do but carry on so I did, but soon after I ran onto reserve. 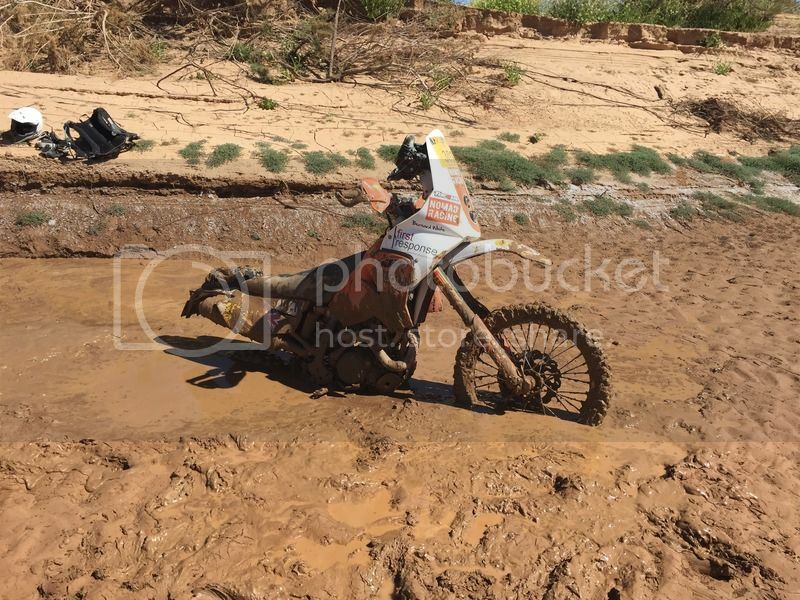 I had decided that I didn’t need the 5 litre rear tank that day and the 13 litre front tank should have been plenty but I had lost a lot of fuel when the bike was on its side in the river bed and this was the result. I soon got onto tarmac and it was a straight run to the fuel station in Zagora. Unfortunately I didn’t make it and ran out with 15km to go. 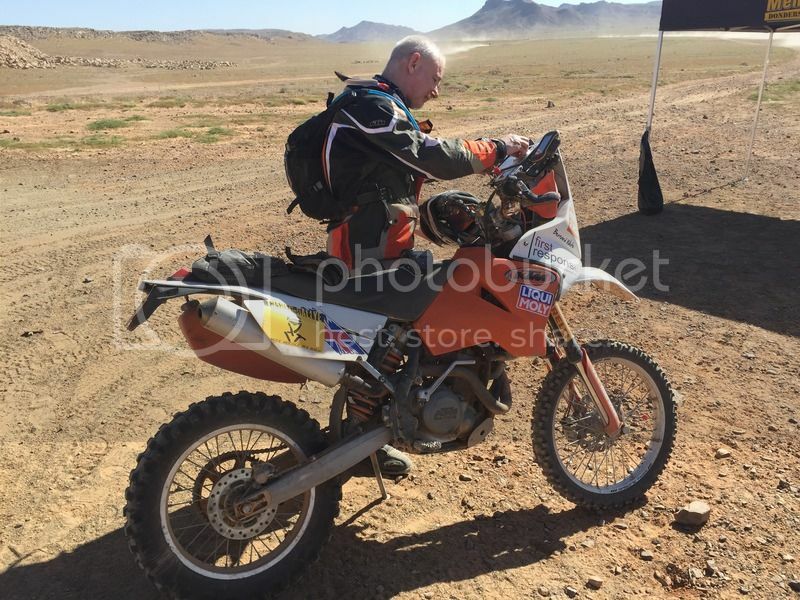 Luckily Michael, another British rider was the next to come past and we managed to transfer some fuel using a plastic sandwich bag!!! 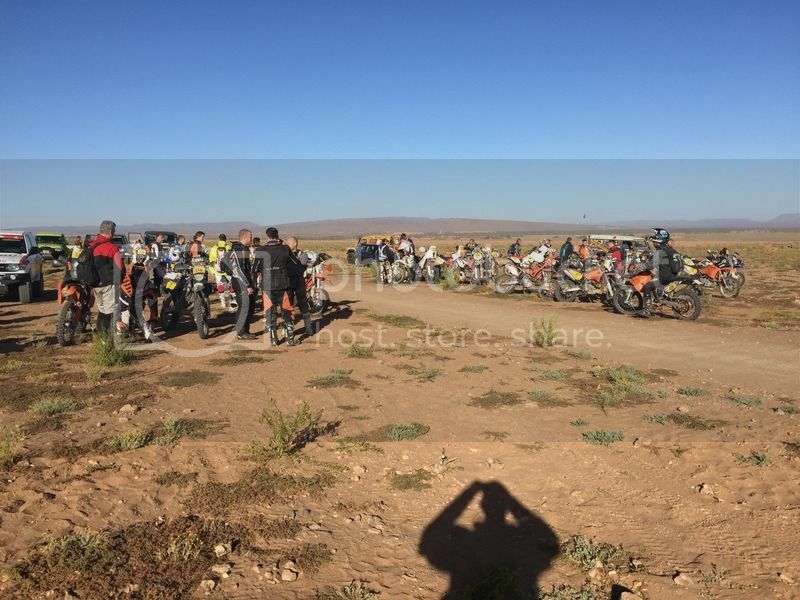 It wasn’t much but got to the fuel station about 7km outside Merzouga…. I bumped into my friend Gary who like me was running on fumes only to discover they had run out of petrol! Again a local came to our aid and led us on his moped to a local village about 2km where the shop had petrol. I managed to get to within 100m of the store before running out and having to push in. We bought our fuel, dispensed in a 5 litre plastic bottle that once contained olive oil and were able to return to Merzouga and the finish. I then rode to the Touareg Kasbah, our hotel for the next three nights and a much needed shower, which turned out to be cold but by then I didn’t really care! At that night's briefing, the subject of speeding on the diversion route was much discussed, especially Donna's broken window. Several competitors were made to hand in their GPSs so their speed on that section could be checked. The fact that the fuel station had run out of petrol was much discussed and it was clear that many teams were in a predicament despite assurances that they would receive a new supply tomorrow morning. As I hadn't used my 20 litres that day, we were able to "pay back" Donna and Colin who were one of those teams low on fuel and gave them 10 litres for the 5 I had used, always good to be in credit for potential assistance! After this we decided that we couldn't chance the fuel station not getting supplies in time the next day, as Radu's Mitsubishi has a 3 litre V6 petrol engine! 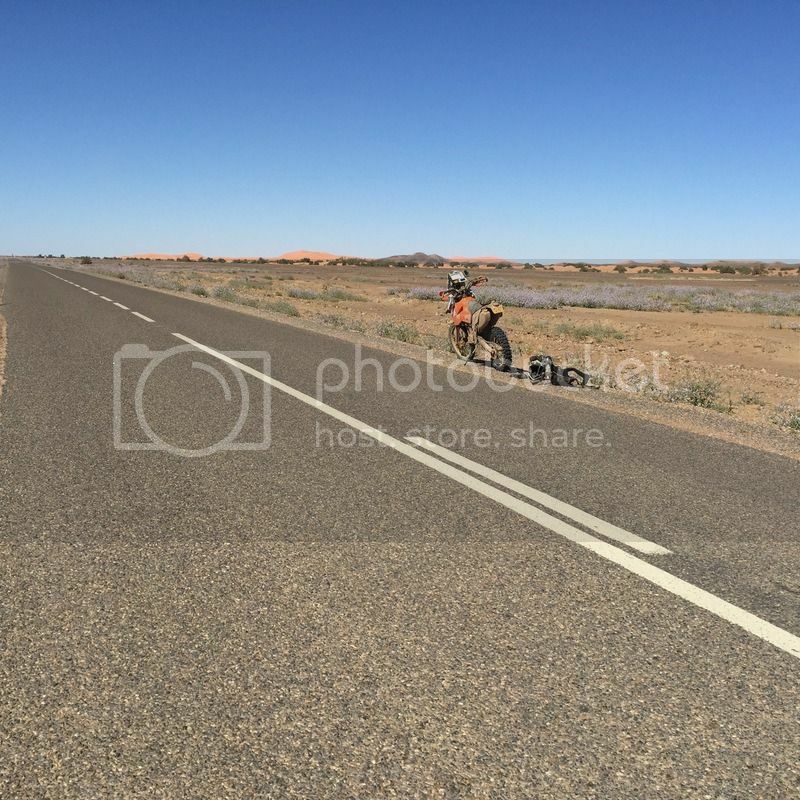 So after draining the rest of my can into the bike, John set off 40km to the next town with four 20 litre Jerry cans in the boot of the Dacia. He returned later with a full 80 litres on board... mission accomplished! Mind you the Dacia stank of petrol as a result!